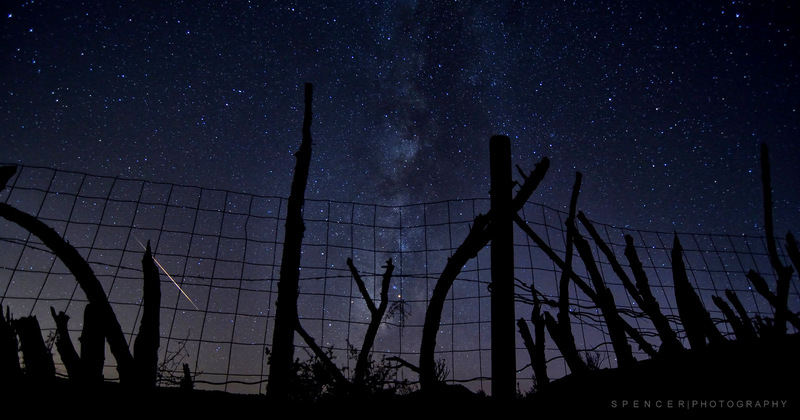 What is the Leonid Meteor Shower anyway? Yearly, about mid November ( This year, Nov 16 to the 18th is peak viewing time) we get a visit from the Comet Tempel-Tuttle. The Earth crosses into the debris path of the comet and this dust and debris slams into the Earth’s upper atmosphere and lights up the nighttime sky with the Leonid meteors. The Leonids will reach its peak on Nov 16th, 17th and 18th. However, its very active days before and after the 17th. This year we have a 75 to 95% moon depending on what day you view the sky and is not a good year to capture meteors. While shooting meteors with no moon is optimal, its still possible to grab some shots of the brighter ones. On Nov 15th the moon sets about 4am (ish) and will set later on the 16th, 17th and 18th. So during the peak (17th) the moon will be higher in the sky. By 2 AM on Nov 15th, the Moon should be in the western sky. So after 2am your chances will increase when looking East and North toward the constellation Leo where the meteors radiate from. Leo rises at about midnight in the mountain timezone. The meteors originate from the radiant of the Constellation Leo and travel through the Eastern sky – Sometimes North and sometimes South. But you shouldn’t point your camera directly Northeast however. Orient your camera in portrait mode, face directly high North and position the North East sky on the right edge of your frame (view finder). Why? The meteors come from the radiant but don’t appear until they hit the earths atmosphere in the Northern sky and directly above. Note that you will see meteors everywhere: To the North, directly above, to the south, directly east, etc. But the bulk of the meteors SHOULD appear in the high North and North East sky. But don’t take my word for it. Get out, look around and decide for yourself. I’ll be using two cameras to grab up a little more sky and increase my chances of grabbing some useable photos. 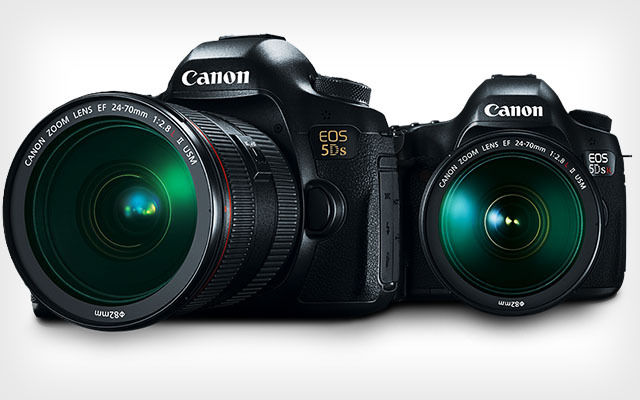 A camera (DSLR) capable of high ISO capabilities – The best choice will be a full frame DSLR like a Canon 1D/5DMKIII/MKII/6D, a Nikon D4/D3s/D700/D600/D800/D4, etc, and other brands of full frame cameras. Full frame sensor cameras are the best choice for capturing the shower because of their stellar high ISO performance. But the show would be easily captured as well with a crop sensor (APS-C size) like that of a Nikon D3100/3200/D5100/D5200/D7000/D7100/D90/D300(S), etc, or a Canon T2/T3/T4/T5/40D/50D/60D/7D, etc. As far as other cameras such as point n shoots or mirrorless are concerned, if they have the option to shoot in manual and set the exposure, aperture, and ISO, they should be able to grab something useable. But to be honest, I’m not sure as I don’t own one. 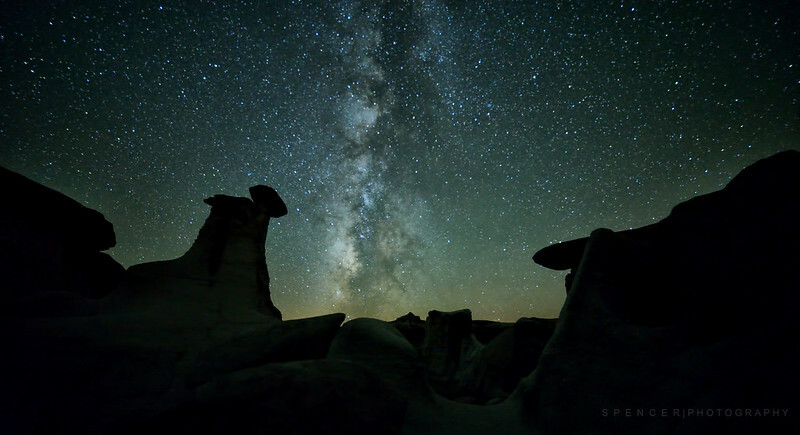 A fast wide angle lens – Because of the dark sky, a fast (f/2.8 or faster) aperture lens would be preferable. The wider the view, the better because you will want to have the radiant (where the meteors come from) in the right part of the lens (view finder) as well as the high northern part of the sky. I’ll be using a 14mm lens. A wide zoom lens is fine too and with most of those the fastest aperture is f/3.5. You will also want to set your auto focus to OFF and then manually set the lens to the infinity focus setting. I use electrical tape to secure my focus ring so it doesn’t move if I accidentally touch it during the night. A wired or wireless remote – Some photographers prefer to use a wired intervalometer/remote. This device allows you program and setup an automated continuous cycle of 30 second exposures. This is really handy if you don’t want to stand by your camera for hours hitting the shutter button over and over every 30 seconds. Some of the newer Nikons and Canons (and others) have built in intervalometers. Most DSLR’s have the option to use a IR (wireless) Remote and you might be able to pick one up at a local camera retailer for $20 dollars. However, if you don’t have any of the above, its really not that much work to setup a chair by your camera and just hit the shutter button every 30 seconds. 😉 To lighten my load when I’m out shooting the Milky Way, I dont carry a remote of any type. I just hit the shutter. If the tripod is sturdy, its fine. 3. Because we have a bit of a moon this year, set a 20 second exposure time (Shutter speed). If you shoot any longer than 30 seconds you will start to end up with star trails and this will cloud and hide any meteor. 6. Set the lens to manual focus and then focus to the infinity mark. 7. Set your ISO to what you want to shoot at. Depending on the Moon and the time of night, I’ll be shooting at anywhere between ISO 400 and 1000 (at 10 to 30 seconds). I’ll take a few test shots at 20 seconds/ISO200 and look at the exposure to see if its light enough. If a bit dark, I’ll elect to extend my exposure to 30 seconds. If still a bit dark at that point, I’ll up my ISO to 400, 640, etc until the exposure looks good. If still dark, I’ll go up to ISO2000, etc. Every camera is different and you will need to experiment. Again, I suggest you experiment, take a few photos and look at the result on your cameras LCD screen. Too Dark? Increase the ISO. Too light or over exposed? Lower the ISO or lower the shutter time to 20 seconds, 15 seconds, etc. If your fastest aperture is F/3.5 or F/4, etc., you will have to compensate with a higher ISO setting or keep the shutter open longer. For the really bright comets ISO 200 or 400 will work just fine. For the barely visible comets ISO2000 or higher will be needed. Because there is moonlight this year, I’ll be using the lower ISO’s – 400, etc. Take Away: Start with 30 seconds at ISO400 and go from there. Lets get down to business. I’m a huge fan of any photo made at night. This is hands down my favorite type of photography. 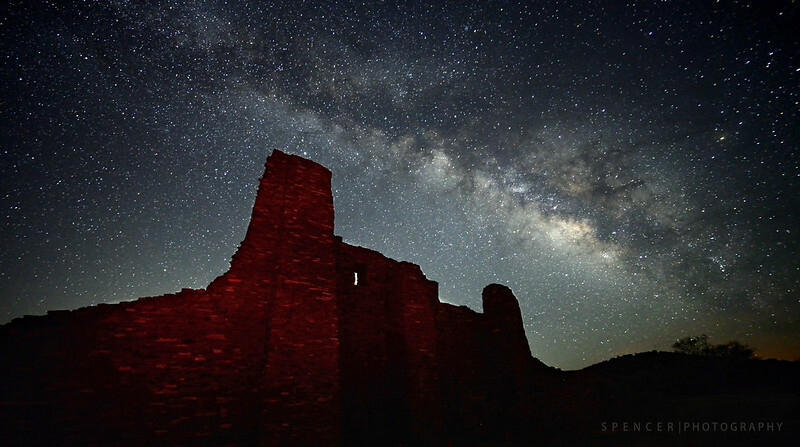 Included is the Milky Way, star trails, a single snap of the scape with stars – Any photo made at night. 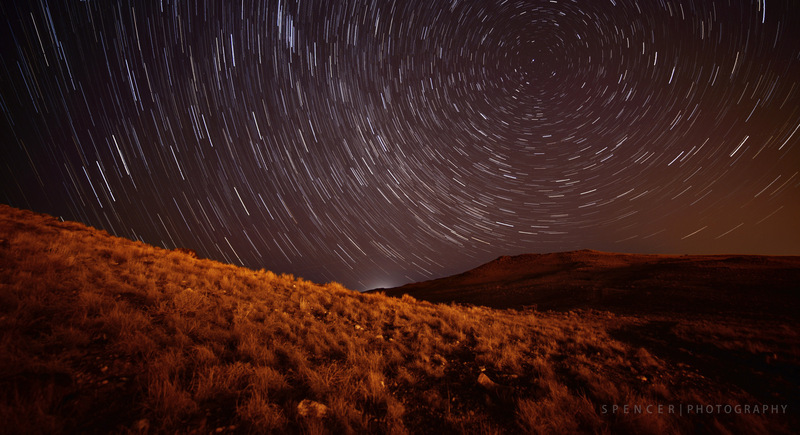 I especially enjoy star trails because of the perspective it gives to the landscape from the Earths rotation. 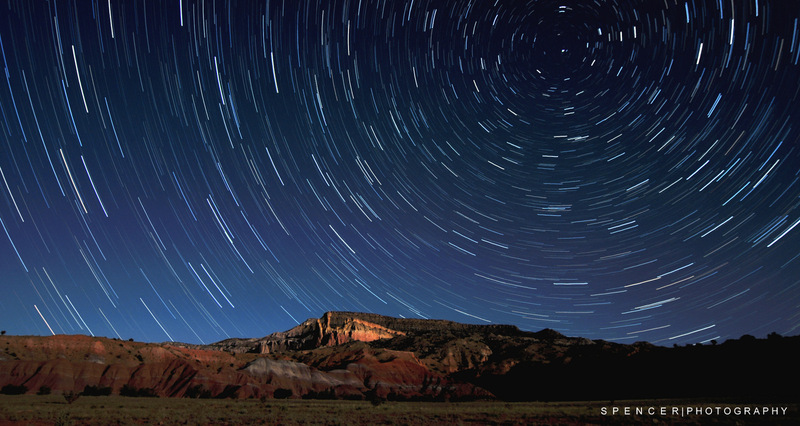 Some folks think the only way to make star trails are with a single 30 minute exposure. Shooting a single 30 minute plus exposure is totally fine but the photo will be super noisy. I prefer to take 70-90 exposures at 30 seconds each and stack them. Stacking photos results in a cleaner final image. Some photographers like to shoot hundreds of photos and stack those. I normally shoot for about 30 to 45 minutes. At 30 seconds a piece, you will get two images every minute. Unlike photographing the Milky Way (That Blog Post coming soon), I prefer to have a 3/4 (ish) Moon to illuminate the landscape. It balances the photo with light and exposure. On some lighter colored landscapes a full Moon may be a little bright and over power the stars. 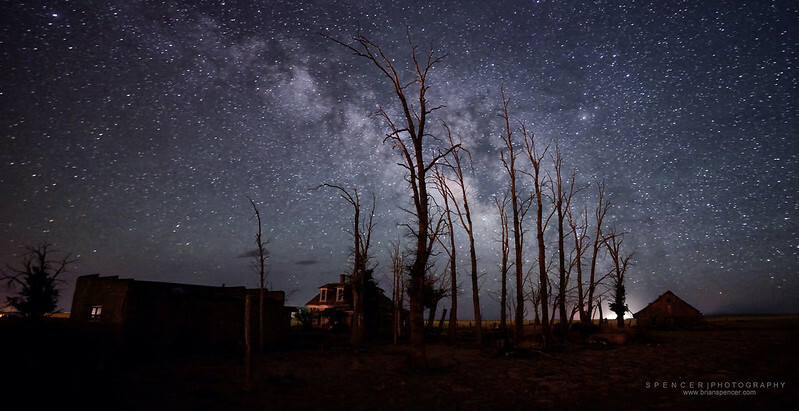 Bright lights from a city will work too if the lights are behind the camera and illuminating the landscape gently. Of course there have been times I’ve stacked photos with no illumination of the scape. But I will always prefer some light when I can get it. I usually choose my location with something interesting in the foreground like mountains, an old building or a dead tree to give the entire photo perspective. I never photo just the stars alone. In addition, I always choose a Northern view with the North star in the frame to take advantage of the earths rotation and the view it creates when stacked. Finally, I always make sure there will be no extra lights like headlamps, automobile headlights, etc in my shot because a single exposure with extra light can ruin the entire stack. Always make sure you are shooting in a location with no light interruptions. 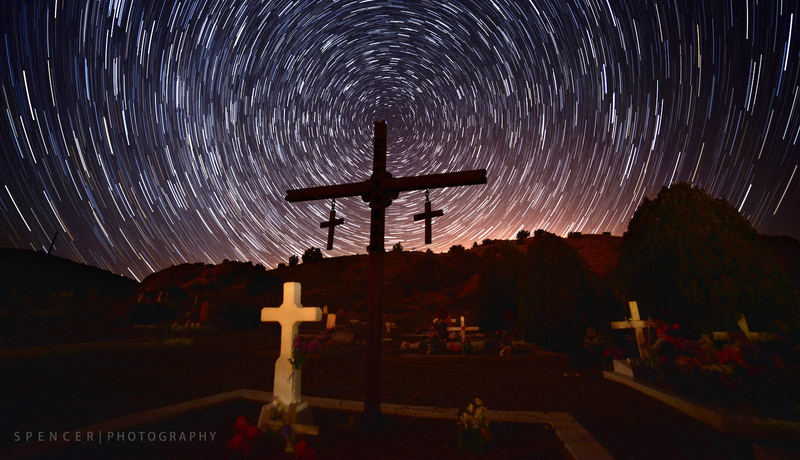 You can make star trails with most any camera that has the ability to make 30 second exposures at ISO200. 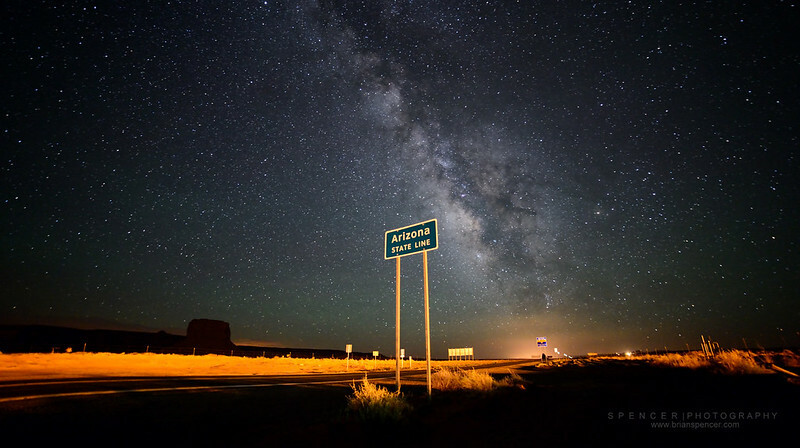 When I photo the Milky Way I only use a Full Frame DSLR because of its high ISO performance. But with stacking photos, 30 seconds at ISO200 with a fast lens (f/2.8) and any DSLR is perfect. So I’ll use either my crop sensor or my Full Frame to make photos and then stack. Camera – Any Full Frame DSLR like a Canon 1D/5DMKIII/MKII/6D, a Nikon D4/D3s/D700/D600/D800/D4, etc, and other brands of full frame cameras are perfect. Any crop sensor (APS-C size) like that of a Nikon D3100/3200/D5100/D5200/D7000/D7100/D90/D80/D300(S), etc, or a Canon T2/T3/T4/T5/40D/50D/60D/7D, etc. As far as other cameras such as point n shoots or mirrorless are concerned, if they have the option to shoot in manual and set the exposure, aperture, and ISO, they should be fine. The take away here is find a camera that can shoot in manual (M mode) at ISO200 for 30 seconds. Lens – If using a DSLR, the best is a fast wide lens. My favorites are the Tokina 11-16mm f/2.8 on my crop sensor (APS-C) and my Samyang 14mm F/2.8 on my Full Frame. I always shoot wide open at f/2.8 and at the widest angle of view. Now most people get their cameras with kit lenses (18-55mm) and most of those lenses have a maximum aperture of f/3.5 at 18mm. I’ve done stacks with F/4 lenses and raised my ISO to 320. So a kit lens like a 18-55mm should be fine. Tripod – A must have. This is VERY important. You will need a very sturdy tripod to mount your camera on as you will be shooting for 30 or more minutes to make about 70 to 90 photos to stack. If your tripod moves even a little bit when shooting, your final product will result without the perfect curvature of the trail reflecting the Earths rotation. Intervalometer – Some photographers prefer to use a wired intervalometer/remote. This device allows you program and setup an automated continuous cycle of 30 second exposures. This is really handy if you don’t want to stand by your camera for 30 or 45 minutes hitting the shutter button over and over every 30 seconds. 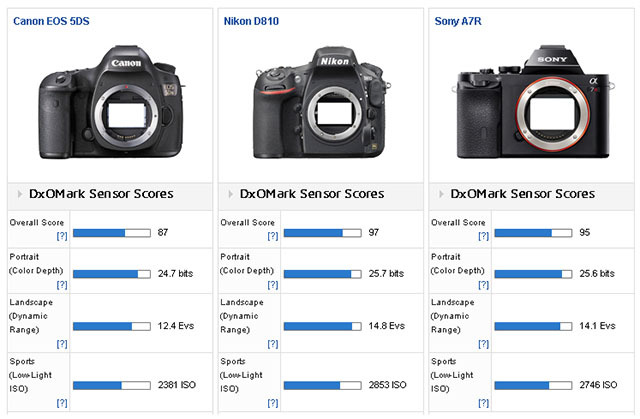 Some of the newer Nikon and Canon models (and others) have built in intervalometers. However, if you don’t have any of the above, its really not that much work to setup a chair by your camera and just hit the shutter button every 30 seconds if you have a sturdy tripod. 😉 I use one like this. Or just search for Amazon or your favorite camera retailer for “Intervalometer”. Don’t forget to have a fully charged battery and a memory card with enough room to store a few hundred files if you’re shooting for a couple of hours. 1. Find your spot and secure the camera to the tripod. Once you have your view, don’t move the camera when shooting. 2. Set your camera to M or Manual mode. 3. Set your aperture to its fastest f/2.8, f/3.5, etc. 4. If using a zoom lens, set it to the widest view. 18mm, etc. 5. Turn off Autofocus and set your lens to the infinity mark. Look at the lens focus ring and find the focus mark (line) and line that up with the infinity symbol (the sideways 8). 6. 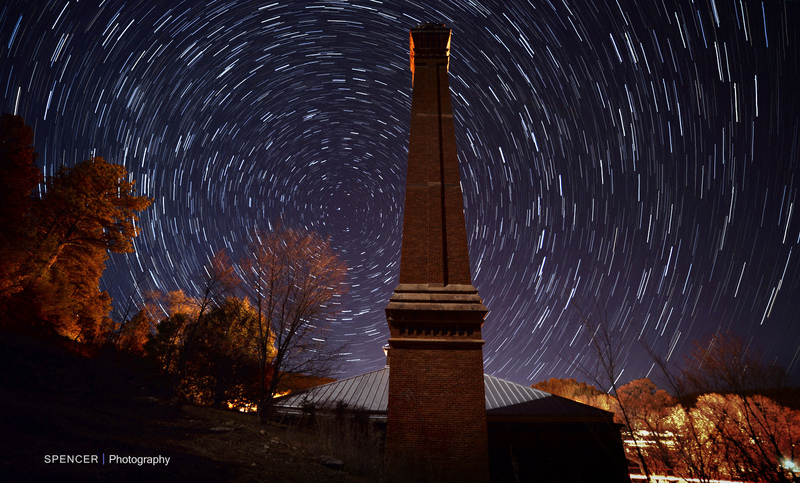 Set your exposure to 30 seconds if you are manually hitting the shutter button. You will hear the shutter open and then close after 30 seconds. Just hit the shutter button again and repeat 70-90 times. Or you can use and intervalometer to automate the process. 7. Set your NR (Long Exposure Noise Reduction) to OFF. This is VERY important. NR takes an additional 30 seconds after EVERY photo to reduce noise. If turned on, you will end up with gaps in the stack. 8. RAW vs. JPG – I shoot in RAW and process my RAW photos in Nikon Capture NX or Photoshop. But you will be fine to shoot and JPG and still get some amazing results. 9. Set your camera to ISO200 and turn off Auto ISO. Take a test photo and make sure the exposure looks good. Too dark? Adjust your ISO up to 320 and then take another photo. If the photo looks a bit dark, don’t worry. You can add light and contrast in your post process. I stack my photos in Photoshop. But there are lots of other free pieces of software out there to do it. You can Google the process or find it on Youtube. I might be putting together another blog post about how I stack later on down the road. But for a free, quick and easy way, visit http://www.startrails.de and download their stacker. Adjust contrast and brightness using another free photo editor such as Picasa from Google after you have completed the stack.